For a short period of time, acoustic telephones were marketed commercially as a niche competitor to the electrical telephone, as they preceded the latter's invention and didn't fall within the scope of its patent protection. 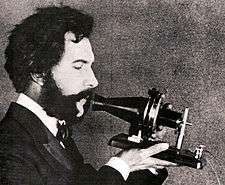 When Alexander Graham Bell's telephone patent expired and many new telephone manufacturers began competing for customers, acoustic telephone makers quickly went out of business. Their maximum range was very limited, but hundreds of technical innovations, resulting in about 300 patents, increased their range to approximately a half mile (800 m) or more under ideal conditions. 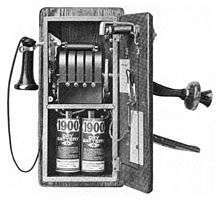 An example of one such company was the Pulsion Telephone Supply Company created by Lemuel Mellett in Massachusetts, which designed its version in 1888 and deployed it on railroad right-of-ways. 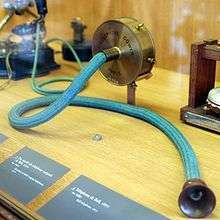 Credit for the invention of the electric telephone is frequently disputed, and new controversies over the issue have arisen from time-to-time. Charles Bourseul, Innocenzo Manzetti, Antonio Meucci, Johann Philipp Reis, Alexander Graham Bell, and Elisha Gray, amongst others, have all been credited with the telephone's invention. The early history of the telephone became and still remains a confusing morass of claims and counterclaims, which were not clarified by the huge mass of lawsuits to resolve the patent claims of many individuals and commercial competitors. The Bell and Edison patents, however, were commercially decisive, because they dominated telephone technology and were upheld by court decisions in the United States. Prior to the invention of the telephone switchboard, pairs of telephones were connected directly with each other, which was primarily useful for connecting a home to the owner's business. A telephone exchange provides telephone service for a small area. Either manually by operators, or automatically by machine switching equipment, it interconnects individual subscriber lines for calls made between them. This made it possible for subscribers to call each other at homes, businesses, or public spaces. These made telephony an available and comfortable communication tool for many purposes, and it gave the impetus for the creation of a new industrial sector. 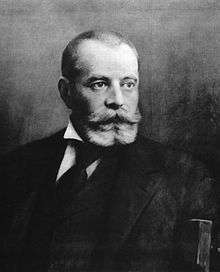 The telephone exchange was an idea of the Hungarian engineer Tivadar Puskás (1844 - 1893) in 1876, while he was working for Thomas Edison on a telegraph exchange. 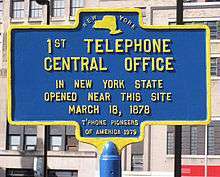 The first commercial telephone exchange was opened at New Haven, Connecticut with 21 subscribers on 28 January 1878, in a storefront of the Boardman Building in New Haven, Connecticut. George W. Coy designed and built the world's first switchboard for commercial use. Coy was inspired by Alexander Graham Bell's lecture at the Skiff Opera House in New Haven on 27 April 1877. In Bell's lecture, during which a three-way telephone connection with Hartford and Middletown, Connecticut was demonstrated, he first discussed the idea of a telephone exchange for the conduct of business and trade. On 3 November 1877, Coy applied for and received a franchise from the Bell Telephone Company for New Haven and Middlesex Counties. 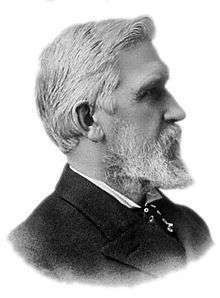 Coy, along with Herrick P. Frost and Walter Lewis, who provided the capital, established the District Telephone Company of New Haven on 15 January 1878. Richard Waller and edited by R.T. Gunther. "The Postthumous Works of Robert Hooke, M.D., S.R.S. 1705." Reprinted in R.T. Gunther's "Early Science In Oxford", Vol. 6, p. 185, 25 Archived 24 May 2014 at the Wayback Machine. ↑ "Voicepipes and Speaking-Tubes". The Museum of Retro-Technology. 15 March 2010. Retrieved 17 October 2012. 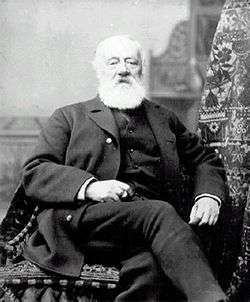 ↑ "H.Res.269 - Expressing the sense of the House of Representatives to honor the life and achievements of 19th Century Italian-American inventor Antonio Meucci, and his work in the invention of the telephone. 107th Congress (2001-2002)". U.S. House of Representatives. Retrieved 7 February 2014. ↑ "Puskás Tivadar (1844 - 1893)". Mszh.hu. Archived from the original on 8 October 2010. Retrieved 2012-07-01. 1 2 3 4 5 6 7 Withdrawal of National Historic Landmark Designation: Site of the First Telephone Exchange, New Haven, New Haven County, Connecticut, United States National Park Service, United States Department of the Interior, 13 April 2006. Archived 15 August 2012 at the Wayback Machine. ↑ "History Of The Invention Of Telephone". The Reverse Phone. 9 June 2011. Retrieved 22 April 2012. 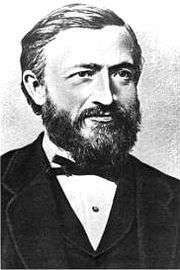 ↑ "Antonio Meucci - Questions and Answers". Chezbasilio.org. Retrieved 2012-08-30. ↑ Bennett, Alfred Roslin (1895). Telephone Systems of the Continent of Europe. p. 337. Retrieved 14 June 2012. ↑ "Early U.S. Telephone Industry Data". Retrieved 15 June 2012. ↑ "AT&T: History: Origins". Corp.att.com. Archived from the original on 20 August 2012. Retrieved 2012-08-30. ↑ "Leaders in the early spread of telephone service". Purplemotes.net. 21 March 2010. ↑ "1947 memo by Douglas H. Ring proposing hexagonal cells" (PDF). Retrieved 2012-08-30. ↑ Farley, Tom; van der Hoek, Mark (1 January 2006). 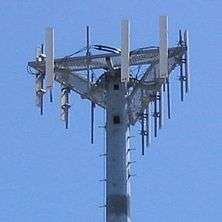 "Cellular Telephone Basics". PrivateLine. Retrieved 22 April 2012. ↑ interview of Joel S. Engel, page 17 (image 18) Archived 16 June 2007 at the Wayback Machine. ↑ Kramarae, edited by Cheris; Lana F. Rakow (1988). Technology and women's voices : keeping in touch (1. publ. ed.). New York: Routledge & Kegan Paul. p. 209. ISBN 0710206798. Retrieved 9 February 2014. ↑ Kramarae, edited by Cheris; Lana F. Rakow (1988). 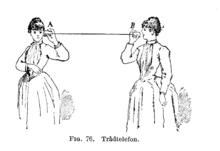 Technology and women's voices : keeping in touch (1. publ. ed.). New York: Routledge & Kegan Paul. p. 217. ISBN 978-0710206794. "Telephone". The 1911 Classic Encyclopedia. Archived from the original on 19 January 2012. Retrieved 22 April 2012.